County Shores is located on the Bay of Quinte at Telegraph Narrows which most anglers know is one of the best fishing locations in the world! Anglers fish for three main species: Walleye (Pickerel), Bass and Pike with the main attraction being the Walleye. Other species like Perch, Catfish and Sheep-head (Fresh Water Drum) are also caught on a regular basis. County Shores is open for Anglers from the first weekend in May through to freeze up in the Fall. We are also open for Ice Fishing provided safe ice conditions exist during late December, January and February. We welcome all anglers, whether you are staying at County Shores or not, to visit our Bait and Tackle Shop, to launch their boat, or to park their vehicle to go out on the ice during the winter months. 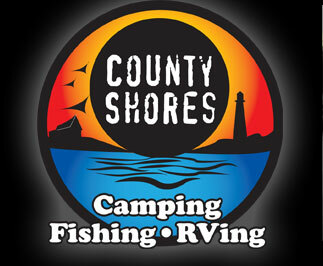 County Shores has all your angling needs covered, we issue Fishing Licenses right at our store, we carry a large variety of tackle and stock 5 different types and species of live minnows. We also offer freezer space to any angler needing to put their catch on ice before the drive home and have fish cleaning stations on site for your use and convenience. The Walleye season on the Bay of Quinte opens the first Saturday in May each year and runs until March 1st of the following year. It is our opinion that there are two types of Walleye in the Bay of Quinte: the "Migratory Walleye" and the "Resident Walleye." The Migratory Walleye are what all anglers dream of. The 4 to 15lbs (sometimes larger) Walleye that comes into the bay in mid to late October and stays here through the winter months, spawn in the spring then head back out to Lake Ontario by late June to early July. Anglers fish hard during these times both in boats and through the ice sometimes facing harsh conditions to catch one of these trophy fish. The Resident Walleye are here all year around. 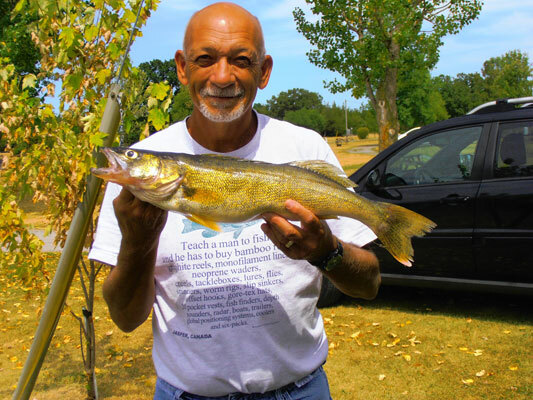 They generally range from 1 ½ to 5lbs and are caught at all times during the Walleye season. Anglers love these Walleye as they are very mild in flavor. They are a favorite of any shore lunch or evening dinner! The Northern Pike season on the Bay of Quinte is similar to the Walleye season and opens the first Saturday in May and closes March 31st the following year. Anglers typically can expect to catch 1 ½ to 13lbs Pike. Bigger Pike are caught (and even musky on occasion) but really large Pike are rare. 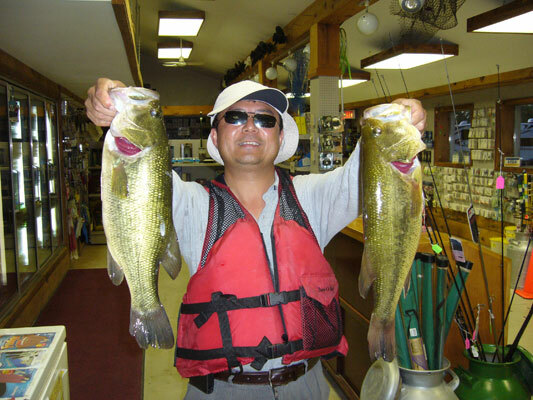 Both Large and Small Mouth Bass are here in the Bay of Quinte and we have seen the population increase significantly since the zebra mussels came in to the Bay. Bass season is open from the third Saturday in June through until November 30 each year. Anglers mainly fish the weeded and bottom areas with structure for bass. Coast Guard buoy anchor locations are a favorite spot for Bass anglers with many being caught around marker buoys. Perch are here in abundance to the point that they become a nuisance to the Walleye anglers. Perch season is open year around. Perch make a great meal if you have the patience to clean them. Angler's will often come onto a school of "Jumbo Perch" and be treated with a catch of Perch up to a pound or 1½lbs. Very tasty! The Sheep Head or Fresh Water Drum are the curse of most Walleye anglers! We mention them simply because if you are fishing for Walleye, sooner or later you will catch one. They are silver to gray in colour with large scales, a turned down mouth and sucker lips. They can be eaten and some anglers will fillet the smaller ones and eat them as "Poor Man's Shrimp!" Ask us when you are here for the recipe. 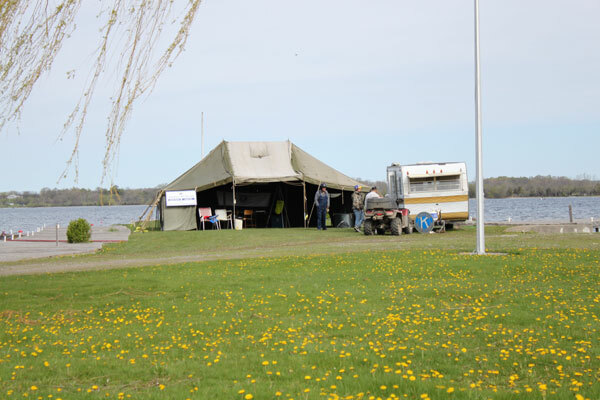 County Shores, being one of the premier fishing destinations on the Bay of Quinte, is proud to sponsor and host a weigh station for the Annual Kiwanis Walleye World Tournament each year. The weigh station is located at the pier and harbour area with easy access for you to enter and weigh your catch by land or water. The weigh station is operated 24hrs by officials of the Kiwanis Walleye World Tournament providing anglers with official weigh in of their catch for the tournament and up to date tournament results. Don't miss your chance to book a site at County Shores to be right in the middle of the action.